The “elves” have come to the village, and they are not the little sprites of legend like Puck. As the villagers flee, Guts takes a stand. The Black Swordsman quest for vengeance has lead him to another demon. Rosine may look cute and innocent, a young girl who has transformed into a butterfly-wind fairy, but evil lurks inside of her. As her “elves” raid through the town for their sick version of play, Guts does what he can to stop her. Seeing them chasing a child, he uses the kid as bait. But killing the elves learns the truth of what they really are. All the children that have gone missing have been transformed into demonic creatures. To defeat this next demon, Guts will have to further destroy his soul. Wounded, hated by the villagers he just saved, Guts ventures out into the woods to find the lair. Jill, the girl he saved, wants to come with him. She realizes that the elf queen is her missing friend Rosine. Wanting to know the truth, she’s about to witness the true horrors of the world. BERSERK doesn’t flinch from the harshness of this world. Even a young girl can sacrifice those she loves and becomes a demon. She has a twisted version of “play.” It’s adult style, where her children-demons fight each other, kill each other, and more. We get a glimpse into the dark psyche of a child raised by abuse manifested in the innocent and heartless way her demonic powers have manifested. Miura’s story continues on. But is Guts on the right path? Is he doing the right thing, or just making the world worse? Can this world even be saved when so much evil pervades it? Miura delves into such deep themes. If you’re a fan of amazing fantasy, especially the grimdark variety, then you need to read this graphic novel! 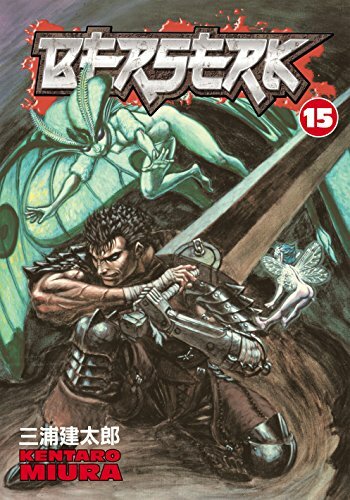 You can buy BERSERK Vol 15 from Amazon.